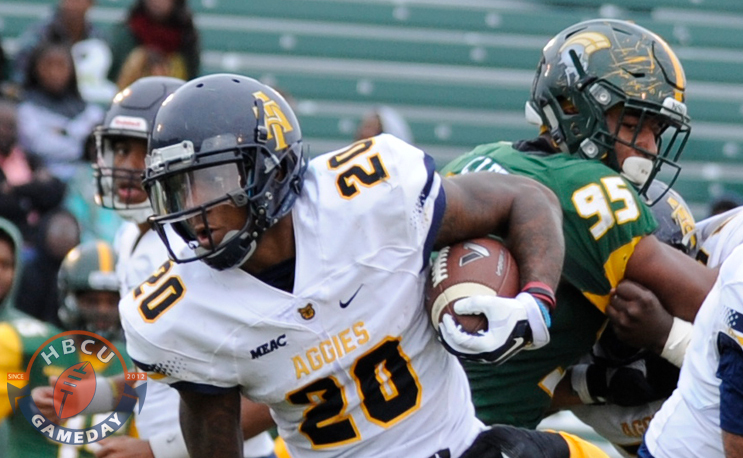 Currently unbeaten, North Carolina A&T could lose its way into the FCS playoffs if it doesn’t win the MEAC. North Carolina A&T is currently riding high and on pace to appear for the Celebration Bowl for the second time in three years. A loss in the last two weeks would complicate that, though, and possibly send another team from the MEAC to Atlanta. It appears, however, that the Celebration Bowl might not be A&T’s only hope for a postseason invite. The FCS Playoff Committee released its rankings and A&T made its debut at no. 10. “They were just lurking outside the top 10 last week and with Northern Arizona’s loss they were able to get into the top 10,” FCS Committee Chair Richard Johnson said. “A very quality team, very well coached and they’re gonna be a team that has the potential to move up as well. A&T is currently 9-0 for the first time in school history, having already equaled its regular season win total from the last three seasons. The MEAC champion, of course, is obligated to the Celebration Bowl. So if A&T wins out, it will be in Atlanta. If not, however, the FCS playoffs are an option. “They will be in our tournament as a potential at-large if they do not win the MEAC Championship,” Johnson said. Two years ago North Carolina A&T coach Rod Broadway told the world he didn’t think HBCUs were funded properly to win in the FCS playoffs and claim the national title. Last year his team appeared to confirm his suspicion. After dropping a third-straight game to North Carolina Central, A&T was awarded a playoff bid on the strength of its 9-2 record. It would go on to get blown out by Richmond on the road one season after Broadway’s proclamation, which came after it won the first-ever Celebration Bowl in 2015. Many have speculated that with the Aggies going unbeaten through the first three-fourths of the season, there is a legit chance they can actually make some noise in the FCS playoffs. We may actually get a chance to see that, if they lose a game. Hold on to your seatbelt. Hoping to get back to the Celebration Bowl. It does so much more from a national exposure standpoint for an HBCU. After A&T’s win in the inaugural Celebration Bowl, applications for enrollment to A&T increased some 50%. You cannot tell me that much of that can’t be contributed to the national exposure that bowl game provided.